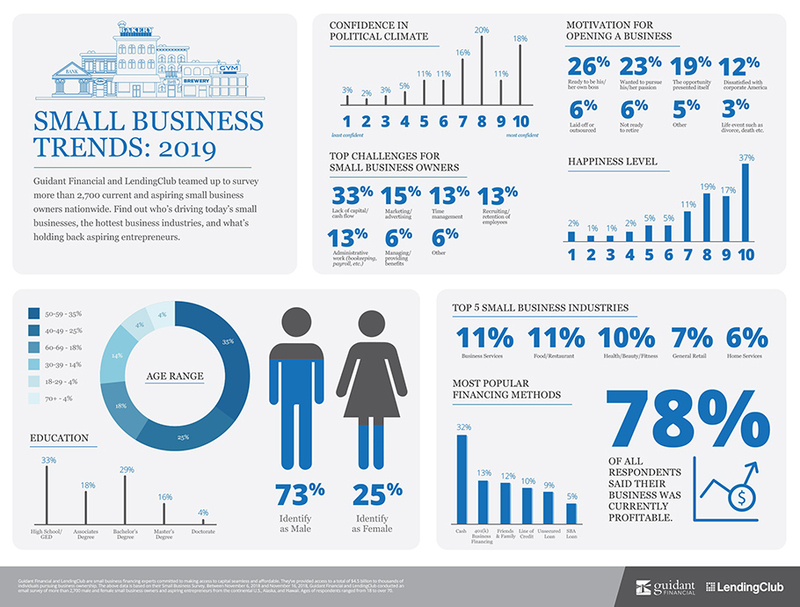 To learn about small business trends and life as a small business owner, Guidant Financial partnered with online lending marketplace LendingClub for their annual State of Small Business survey. More than 2,700 current and aspiring business owners across the country responded to questions ranging from their confidence in the economy to obstacles they faced pursuing business ownership. Here’s a look at current small business trends and what to expect in 2019. What’s it like being a small business owner today? With corporate profitability at its highest in four years, favorable GDP growth, consumer spending up year over year, and the percentage of investment as part of the economy back to pre-2008 levels, the US economy in 2018 continued to go strong after a thriving 2017. Small business owner confidence has increased over the year in this lucrative environment, and interesting new challenges have cropped up. 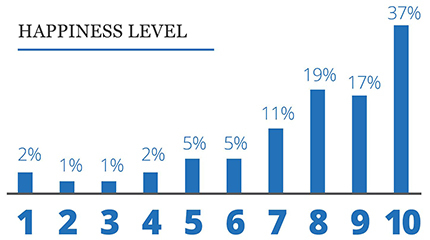 With 78 percent of small businesses reporting profits, it might not be surprising that current business owners rated their level of happiness as an average of eight on a scale of one to 10 (10 being the happiest). A substantial 53 percent of business owners surveyed ranked their happiness at nine or above, showing a majority as happy in their role as a small business owner. Small business owners aren’t just happy in their roles, they are also confident in the state of small business in today’s political climate. Only 24 percent of small business owners surveyed rated their confidence under five on a scale of one to 10 (10 being the most confident). 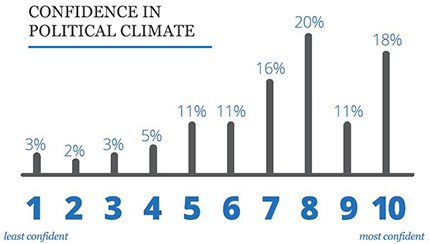 As in the previous year, the average small business owner’s answer on the confidence scale was seven. It’s a tight labor market, with the jobless rate hovering around 3.7 percent. While the 49-year low of the American unemployment rate does bring big benefits to the economy, it also creates unique challenges for small business owners. Small business owners reported a significant 15 percent increase in challenges with recruiting and retaining employees. The majority of small business owners (41 percent) only employ two to five employees, which means each employee counts – underperformance can be deadly to a small business’s profitability. Given these small employee populations, recruiting and retaining top talent is understandably a major concern. Similarly to the prior year, the majority of small business owners considered a lack of capital or cash flow one of their major challenges, followed closely by trouble with marketing and advertising, time management, and administration work. Despite the challenges of time management and administrative efforts, only 10 percent of small business owners outsource bookkeeping, 17 percent outsource accounting to a CPA, and 15 percent of small business owners outsource payroll. While many businesses outsource at least one service, there may be more room for small business owners to mitigate challenges with thoughtfully outplaced business services. Who are today’s small business owners? While 2018 business news has focused on Generation Z beginning to enter the workforce and millennials continuing the disrupt industries with ambitious start-ups, small business continues to be ruled by boomers. 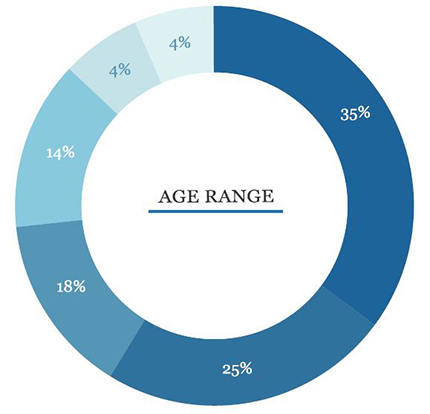 57 percent of small business owners surveyed were over the age of 50, a small increase year over year. While the overall percentages of education in small business owners hasn’t changed dramatically from 2017, there are great shifts in the share of levels of higher learning. There was a 32 percent increase in the share of business owners with doctorates and a 9 percent increase in those with Master’s degrees — possibly due to the influx of those over 50 years old seeking degrees. 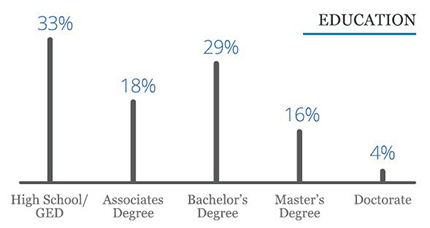 Despite the changes in the share of entrepreneurs with high-level degrees, the largest segment of small business ownership education remains at the high school level, at 33 percent of small business owners surveyed. The majority of business owners are profitable, regardless of education. There’s very little difference between the levels of education, with all segments showing profitability within a few percent points of the 70 percent average. Higher education doesn’t predicate entrepreneurial success, as demonstrated by the business owners surveyed. With very little change from year to year, most small business owners choose to go into business for themselves because they were ready to be their own boss (26 percent) or pursue their own passion (23 percent). However, these numbers rise when looking at owners of profitable businesses. These ambitious small business owners are focused on working for themselves and not others (49 percent) and finding personal satisfaction in their work (42 percent). This is opposed to the population of entrepreneurs who started small businesses for less personal reasons, such as the 10 percent who weren’t ready to retire or the 11 percent who were laid off. What are today’s small businesses? The majority of small business owners report that their businesses are currently profitable, a 6 percent increase from the previous year. The 37 percent plurality of these businesses are well-established entities with experienced owners, having been in operation for over a decade. Half of the profitable businesses in 2018 were purchased as an independent business already in operation while the next largest segment was independent start-up businesses, at 39 percent. 2018 brought a notable increase in health, beauty, and fitness businesses such as wellness spas, salons, and gyms. It’s possible the 34 percent increase in these industries can be attributed to the boom of consumers becoming more wellness-conscious and knowledgeable via social media. While not as dramatic, there was also a rise in food businesses and restaurants, at a 14 percent increase, keeping it as the second most populous industry for small business ownership. Business services continued to reign as the largest segment, at 11 percent. Home services overtook automotive businesses this year, edging automotive out of the fifth spot of top business industries in 2018. While the top five forms of funding remained the same as the previous year, there were numerous shifts in less-utilized forms of financing. The share of mortgage refinancing increased by 33 percent, SBA loans grew by 29 percent, and home equity line of credit (HELOC) grew 27 percent (thanks to low interest rates, a trend likely coming to an end). 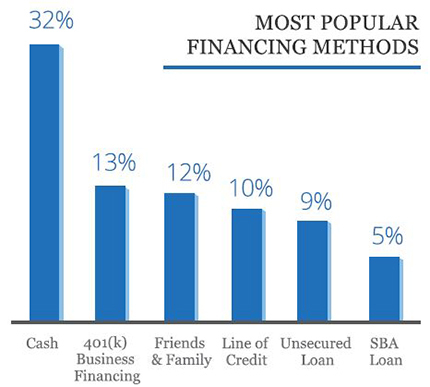 Cash remains the most popular funding method with 32 percent of business owners opting for it. Rollovers for Business Start-ups (ROBS), a method of using retirement funds to start a business without incurring tax penalties, remains in second place at 13 percent. Crowdfunding, no longer the “new kid” in class, takes the bottom of popular funding methods with under 1 percent of respondents using it to fund their businesses, a 10 percent decrease from the prior year. With interest rates on the rise, there’s an opportunity for small business owners to finance their businesses in more beneficial ways. ROBS allows entrepreneurs to use their eligible retirement funds, such as a 401(k), to fund their business without tax penalties or interest rates. There are additional benefits to using ROBS, such as starting a business debt-free and cash-rich. As the economy continues to thrive and consumer spending keeps rising, aspiring small business owners should act now. Learning more about available financing options and pursuing low- or no-interest funding is an excellent way of starting the entrepreneurial journey. The majority of entrepreneurs report high levels of happiness and confidence in the state of small business. Current small business owners may save time, energy, and money by outsourcing their biggest business service challenges such as bookkeeping and marketing. One thing remains true year over year: the American entrepreneur works hard and cares passionately about their small business, with a desire to expand and succeed fueling their daily life.